« My Weather Station: WOW! 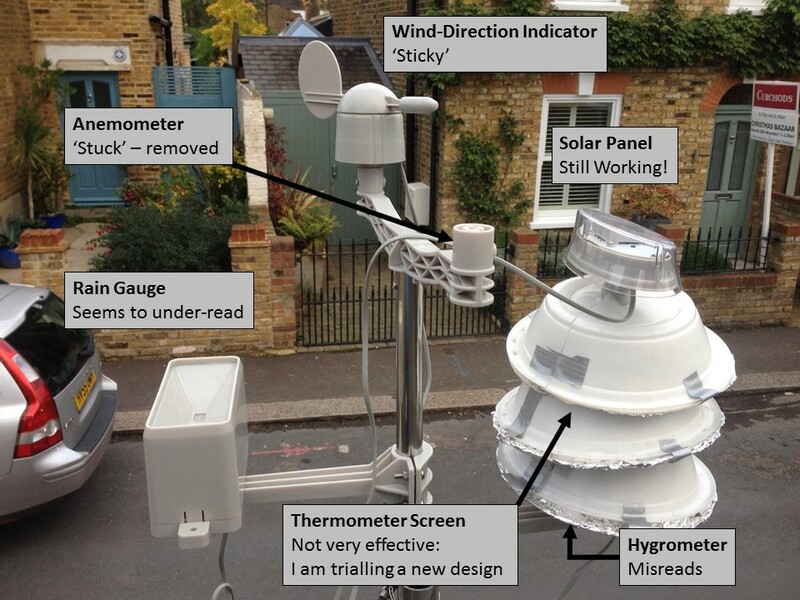 My Weather Station: Not so WOW! The weather station after three months. Only the thermometer appears to be working correctly. However, all the other faults can be corrected. And I still think it is interesting to spend some time and energy trying to fix them. Since my last blog post, many people have asked me “Michael, how is your weather station doing?“. And the answer is ‘not so well’: almost every element of the station has a problem. The anemometer has stopped rotating. The thermometer screen is ineffective – allowing the thermometer to warm rapidly by two or three degrees in sunlight. So only the thermometer appears to working correctly! But despite that, I still consider the station to have been good value, and I am taking steps to rectify each one of these faults. In fact, many aspects of the design appear to be excellent and with a little bit of tweaking I am hoping for many years of service. The problem with the anemometer is that the bearing on which it rotates has seized up. The result is that the anemometer simply doesn’t rotate no matter what the wind speed. The anemometer head dismantled. In use the wind rotates the cups and each time a magnet embedded in the head rotates past a glass-encapsulated reed-relay a voltage pulse is generated in the controller. The wind speed is then just proportional to the number of pulses in a given time period. The wind gust speed can be estimated from the shortest time interval between two pulses. Aside from the low quality bearings, the design is otherwise admirable. 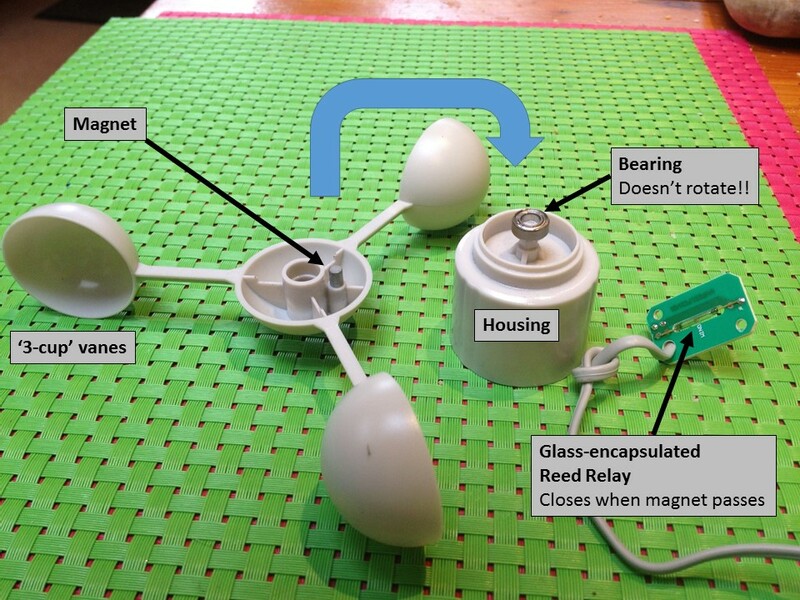 Voltage pulses are generated each time a magnet in the rotating head moves past a reed-relay in the housing. This should be highly weather-proof and have a very long service life. Although it sounds complicated, replacing the bearing is not so hard and I have ordered a new one. To do this one just needs to specify the inner diameter of the bearing (that sticks on the weather station) and the outer diameter (that sticks to the anemometer head). So I hope that by next week I will have the anemometer up and working. I also ordered a second bearing because the wind direction indicator also felt a bit stiff. The rain gauge appears to be working when I test it, but on some days it doesn’t seem to register any rain. Disassembled Rain Gauge. Rain captured over an area of about 54 square centimetres falls into the bucket which tips over when it is full. 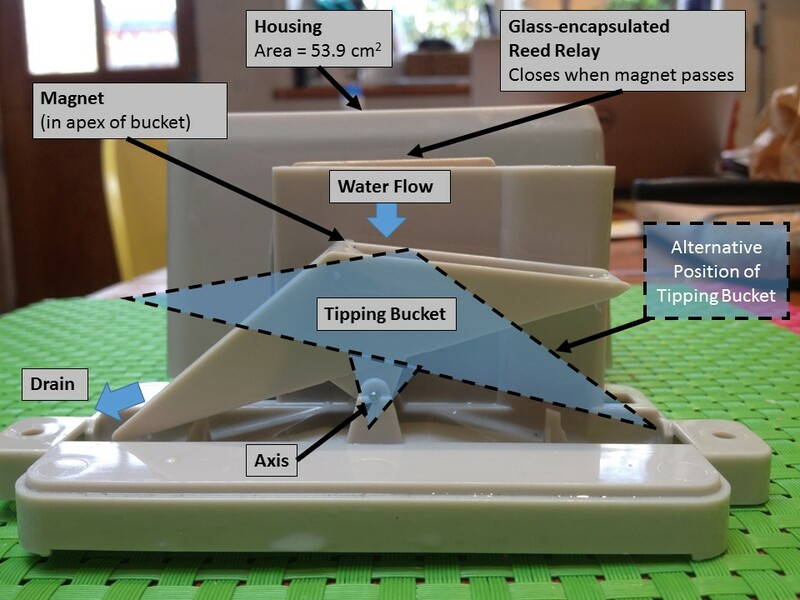 As it tips, a magnet in the apex of the bucket momentarily causes a glass-encapsulated reed-relay in a housing behind the bucket to close. I took apart the gauge and I was pleasantly surprised at the quality of construction. I couldn’t see anything that would break in service – but I still haven’t understood why it isn’t working! I may have to change either the magnet or the reed relay. I noticed there was a problem with the thermometer screen by looking at the Met Office’s Weather Observations Website. There I could see that when it was sunny, my thermometer read up to 3 °C hotter than those in weather stations within a kilometre or so. The bowls were thin and slightly transparent, and so I put a layer of aluminium foil between two bowls to make an object which would allow air to flow to the temperature sensor, and yet shield it from direct sunlight. By the time I tested this arrangement, sunny days were becoming rare, but it did seem to reduce this rapid heating. However, I will have to wait for spring to test it fully. Hopefully by then I will have engineered a more robust solution that doesn’t look so awful! Being married to a world authority on humidity measurement I knew there would be problems with the hygrometer. The basic behaviour of the sensor seemed approximately correct, but I noticed that it never read 100% humidity. I took advantage of recent foggy weather to adjust the Cumulus software relative humidity reading to 100% – the stable temperature, absence of direct sun and the presence of billions of droplets of water in the fog ensure the air really is fully saturated. Living near NPL, I have the great convenience of being able to check atmospheric pressure using NPL’s online barometer. Using this reading – and adjusting for the difference in height above sea level, I made a small adjustment in the Cumulus Software to get the correct reading of atmospheric pressure within about 1 hPa (hectopascal). Despite all these problems, I still think the weather station (at £90) represents exceptional value. It’s basic measurement of temperature seems to be correct, and the solar-powered logging and wireless connectivity is fantastic! Making a significant improvement would involve purchasing a station that would cost £500 to £1000, and these stations are not perfect either. So given the poor measurement site, it doesn’t seem worth spending that much money. However spending a few pounds improving this site seems like good value. One of the reasons for the lack of recent articles is that – aside from being crazily pressured at work – I am attending a FutureLearn course on programming (in Python) for the purpose of analysing data. My hope is to automate the monthly analysis of data, which at the moment is proving very time-consuming. With a trailing wind (which I should be able to measure!) I hope to be able to show some of my data here next week. What interests me is that I need to do exactly the same things that climatologists do the data in order to extract trends. But actually doing something oneself, is difficult, but highly instructive. This entry was posted on November 16, 2015 at 10:15 am and is filed under Personal, Simple Science. You can follow any responses to this entry through the RSS 2.0 feed. You can leave a response, or trackback from your own site. Congratulations on the post¡ I loved. How is the course Python for data analysis? I had heard of other programs for data analysis Tableau Software such as, but not know I had that ability Python. I think the weather data disponene great potential of analysis especially if you cross this information with other variables. Python is … “mixed”. We are learning to use a toolbox called ‘Pandas’ which has great tools for analysing large tables of data. But it is hyper-sensitive to the placement of commas and other formatting details. I will see if I can learn to live with it. There are many data analysis products out there, but not many are (a) robust and (b) free. ANyway I will let everyone know how I get on. Yes, you’re right, there are not many free software and robust analysis. Thanks and good luck with the course. I think you should add something like this! I looked at the accuracy by comparing it with a weather station which has specified accuracy and it stacks up quite well. You can see results at: http://onlinelibrary.wiley.com/doi/10.1002/wea.2158/pdf or I can email you a copy if you give me your address. The biggest problem, as you say, is poor radiation screen, but just putting a simple white plastic bowl on top with some silicone rubber cuts the error by half. (OK you can’t do that so easily because your version has the solar cells on top). Maplin do a version with a black radiation screen !! Pressure drift is low if you keep the console (where the pressure sensor is) out of direct sunlight. Looking forward to your talk at the Royal Met Society meeting next week. Thanks for your comments. I too have experimented with improvised screens and they did work. I will probably have another go this year. As you did, I searched for domestic plastic-wear that could be re-purposed and ended up using disposable plastic bowls backed with aluminium foil. Anyway – the talk is nearly ready for next week! What is the output characteristic for that Maplin wind sensor? It looks like other cheep, easy available, sensors that I want to use with my AVR weather station but I can’t find how many impuls it make by 1 m/s wind speed. Do you have that data? Hi, Have got the code for the anenometer, mine seized too. Thanks.